A Prunus domestica L. cultivar. ‘Reine Claude’ is a synonym of ‘Green Gage’, which see for more detail. 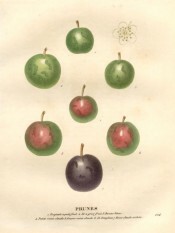 Saint-Hilaire figures both ‘Petite Reine Claude’ and ‘Grosse Reine Claude’, differing only in size, and a third, almost identical, plum called ‘Id Dauphine’, by which appears to be meant ‘Grosse Dauphine’. ‘Dauphine’ is another accepted synonym of ‘Green Gage’ [Saint-Hilaire pl.224/1830]. Don regards 'Reine Claude’ as a variety of ‘Green Gage’ and notes a number of ‘Reine Claude’ varieties. Listed in all published catalogues as ‘Reine Claude’ [Plum no.4/1843]. Prunus domestica ‘Reine Claude’ | Saint-Hilaire pl.224/1830 | BHL. Grosse Reine Claude and Petitie Reine Claude are centre left and centre, with a red blush.